I reviewed Brian’s book at the beginning of November; I started Dr. Bondar’s book soon after but a heavy workload (and a perplexing and inexplicable desire to write a novel in a month) limited me to reading a short chapter roughly every few days. Fortunately, the book is well-suited for that sort of schedule, as I note below. I finished it the other day and thought I’d share a few thoughts on this very enjoyable and charming book! 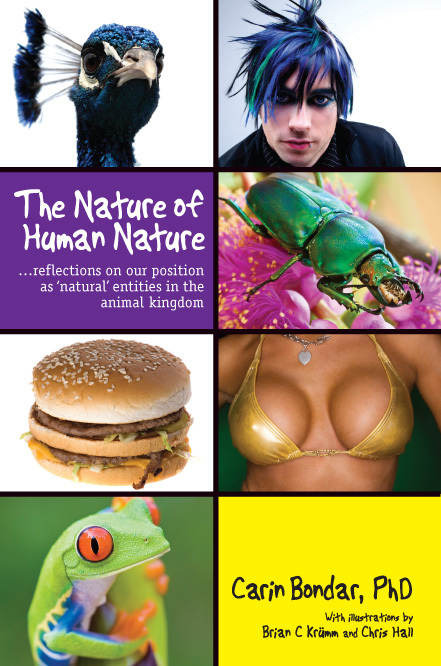 The Nature of Human Nature overall addresses the question: How different is human nature from that of the animal kingdom, really? There are plenty of things that humans do that seem, on the surface, unnatural — cross-dressing, junk food eating, aromatherapy — but the natural world has shown its own form of ingenuity in adopting analogous behaviors. Our own unusual activities can be understood better by looking at how and why other animals do them. The book is divided into two major sections, Survive and Reproduce, and each of these sections is broken into short chapters that highlight different strategies that humans and animals share to achieve these biological imperatives. The individual chapters are illustrated with cute single-panel comics that highlight the concepts discussed. Each chapter is more or less self-contained, which made this book ideal for my intermittent reading time over the past month! The food pyramid. It turns out that some lowly insects are better than many of us at maintaining a proper nutritional balance! A change of venue. People with medical problems often seek a change in geographical location to improve their condition; so do some fish! Buy me dinner first. If the man doesn’t pick up the check on a date, many a woman would think of the guy as a cheapskate. Female orangutans will also test their men to see how generous they are with the food supply. Dr. Bondar’s book not only explains what the different behaviors are that we share with animals, but why those behaviors are there in the first place; in other words, she explains how seemingly odd behaviors improve our biological fitness, improving our chances to survive and/or reproduce. Each chapter covers a single idea, and describes this idea in clear and entertaining detail. The book as a whole is highly readable, and suitable for pretty much anyone of any age and any level of knowledge. Though I’m a physicist, I consider myself reasonably well read on biology (I read lots of blogs) but I still found tons of surprising and thought-provoking things to mull over. For the more determined readers, endnotes provide technical references for further investigation. One thing I found particularly fascinating about the book: it seeks to show that humans fit very naturally into the natural world, but it manages to do so without invoking the “D” word (Darwin) or the “E” word (evolution) very much. To me, this means that ‘Nature can help explain our biological place to those readers (religious and otherwise) who might have been indoctrinated to have a deep negative visceral reaction to evolutionary catch phrases. I’ve already praised the book to a number of my friends who have seen me reading it (a particular image on the cover, guess which one, always seems to grab attention); it has also been the source of a number of my twitter weird science facts! I wholeheartedly recommend Dr. Bondar’s book to anyone who has an interest in biology and humankind’s place in the animal kingdom. This entry was posted in Animals, General science. Bookmark the permalink.